WOW… what a month it has been! 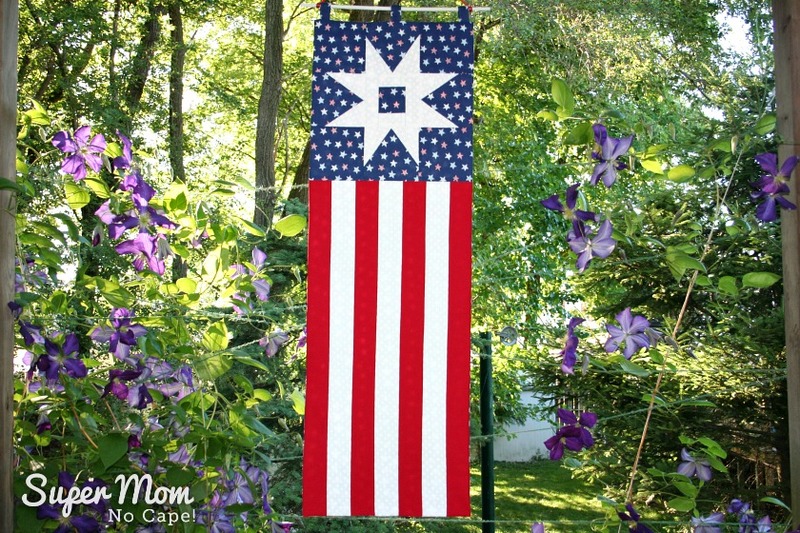 We started June here on Super Mom – No Cape with me introducing the blocks I designed for my month of the In Our Garden BOM. And don’t forget the bonus pattern to Design Your Own Home Tweet Home. Mix and match the pattern pieces to create your own unique birdhouse blocks. 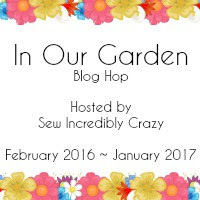 For this final day of my month of the In Our Garden BOM, I have one more quick project that you can make using my Garden Path block. This was such a quick and satisfying make! 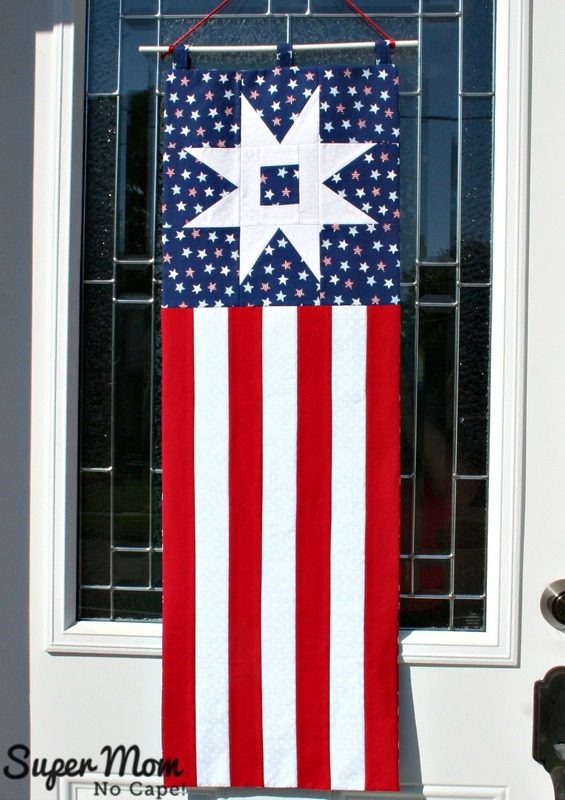 In place of the dark and medium grey fabrics called for in Garden Path Block pattern (pattern is temporarily unavailable), I used the blue star fabric. And there’s no need to worry about cutting off those points. The block is designed in such a way that they are well outside the seam allowance. Cut 4 red and 3 white strips 2¼” X 24½”. Sew strips together using a scant ¼” seam allowance, starting and ending with a red strip. You’ll end up with a piece that is 12 3/4″ X 24 ½”. 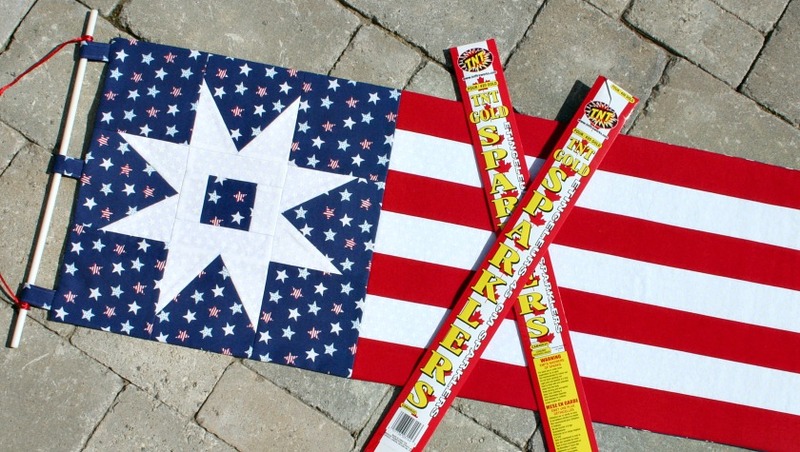 In order to make it 12 ½” to match the size of the block, trim 1/8″ on either of the long sides. Note: Measure the red and white striped section before trimming. I must not have been completely accurate with my ¼” seams because I ended up with a piece that was exactly 12 ½” X 24 ½”. Sew the Garden Path block to the red and white section. Center the fusible fleece on the back of the banner and fuse in place. Cutting the fusible fleece slightly smaller, reduces bulk when the banner is turned. Cut your backing fabric 12 ½” X 36 ½”. 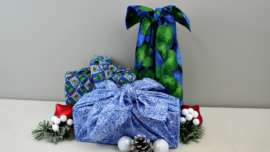 For the hangers: cut a strip of background (blue star) fabric 3″ X 9″. 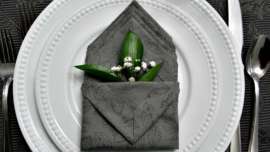 Fold it in half length-wise and press. Open the strip up. Fold one long edge til it meets the center. Press along the fold. Repeat with the other long edge. You have now created double fold tape to match the banner. Sew along the edge. Cut into 3 equal pieces. Fold the hangers in half and pin to the right side at the top of the banner. The two outer hangers are placed 5/8″ in from the side with the third one being centered. Pin the backing to the banner, right sides together. Sew around all four sides, leaving a 4″ opening at the bottom for turning. Turn right-side out. Press well. Sew opening closed. Give it a final pressing. Cut a 14″ piece of doweling (I used a plastic hanger.) Insert the doweling into the hangers. Cut a piece of cording 20″ long, tie to the ends of the doweling. Or in your backyard garden! I love how it looks with the sun shining through! I hope you enjoy making June’s blocks as much I had designing them! As always, if you make something with one of my tutorials, I’d love to see a photo. You can either e-mail me by clicking on the little envelope in the header. Or tag me on Instagram @supermomnocape, Twitter @1SuperMomNoCape or Facebook @1SuperMomNoCape. I’d also love it if you followed me on any or all of them as well! 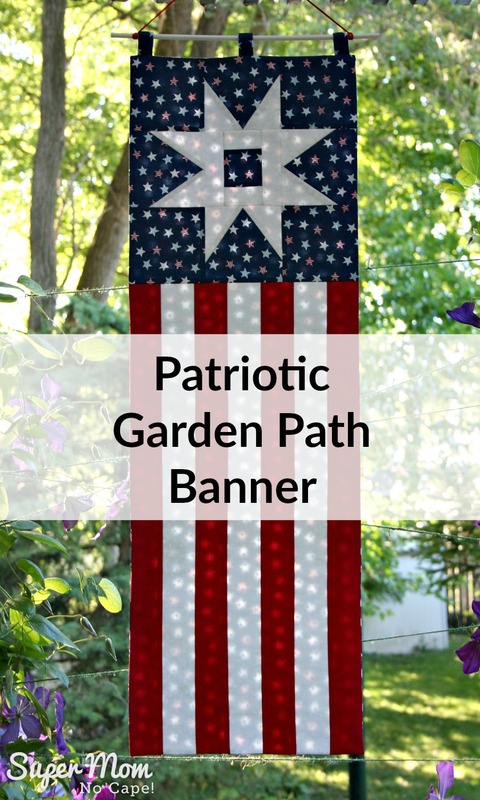 And please do save the Patriotic Garden Path Banner for future reference by clicking on the Pinterest button underneath this post or by sharing it on Facebook and Twitter. What gorgeous banners! Well done! 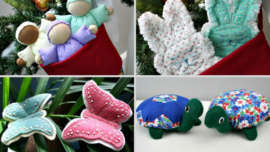 A question: Is there a particular type of fusible fleece you used? I have some that seems like it might be too puffy for a banner. I replied by email but thought I’d reply here too. The fusible fleece I used is a low loft fleece made by Pellon though I’m sure there are other manufacturers. It’s about 1/8″ think. I’m pretty sure I bought mine at Joann Fabrics. I like it for things like the banner because it’s softer than interfacing would be but still gives things a nice bit of structure. I’ll go update the post. Thanks for asking! Love it, so fun and cute, I can see it would make a quick fun project.. This is beautiful, so graphic and cheery! Excellent for the 4th of July! Thank you for sharing. This is such a GREAT project! If I was an American it would definitely be on my TO DO list. What a great banner! Pinning to make!